It's strawberry season in our garden. It looks like I have enough strawberries to pick, daily, for about 10 days, then the harvest will slow down. We're spoiled, I know. 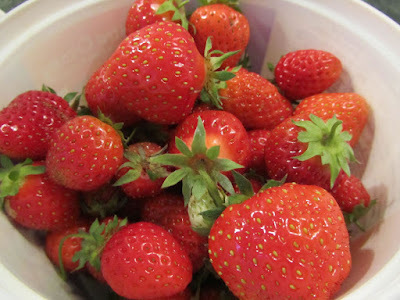 Our guests were delighted to have garden-fresh strawberries, last Sunday. 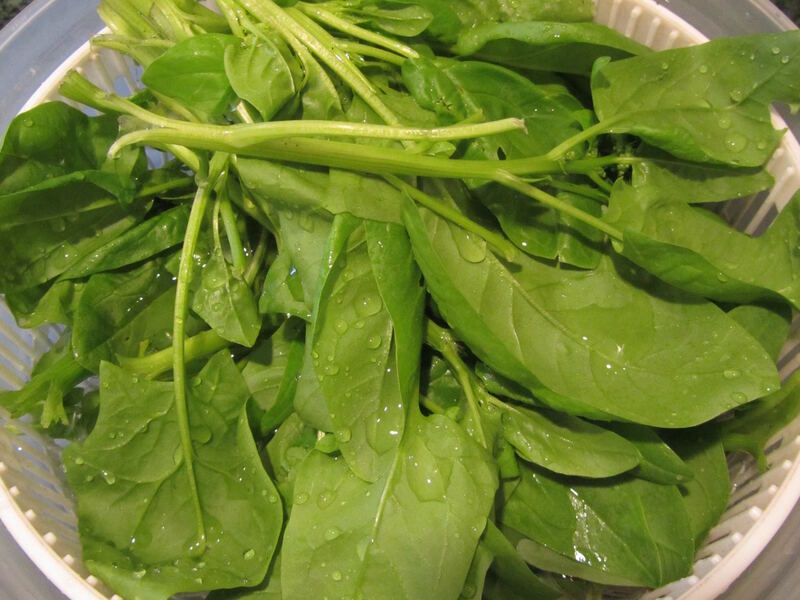 I'm also using a lot of spinach this week, in salads, in the egg Foo Yung, and again last night in the tomato-Florentine soup. I have enough spinach in the garden for one more large picking, then we'll move onto something else. I made a large batch of scratch cornstarch pudding yesterday afternoon -- 8 1/2-cup portions. We managed to fall behind in milk consumption. And with one freezer unplugged, we're low on freezer space for freezing surplus milk. Pudding it is! Two of my kids were home when I made it, and 2 servings were gobbled up before it even cooled. If you use a box for pudding, you really should give scratch pudding a try. The ingredients list is simply sugar, salt, cornstarch, flavoring (cocoa powder or vanilla extract) and milk. And for me, yesterday, I was able to make a quart of pudding for about 75 cents, including the milk. So tell me, what was on your menu this past week? Ha, I scramble at this every week and yet I know it's coming. Let's see if I can remember. Friday - tonight, who knows. I rarely buys frozen processed foods. I dislike them and it costs way too much for my budget.But Wednesday was such a hot and humid day and my son and I needed to get him a lockable storage bin for his apartment next year. We went late afternoon and when we were leaving the store decided it was too hot to fuss too much in the kitchen (the weather should have barely hit 80s but ended up almost 90s which was unexpected). We made a decision to buy frozen pizza to heat up. Neither one of us could figure out what to buy since the entire length of the freezer was all different kinds/brands of frozen pizza and neither did we know how much to buy for 6 people. We bought 3 pizzas and it was only just enough. I will say they actually tasted good and didn't give me heartburn all night long either. We could do that again in a pinch. We brought it downstairs to eat in the basement family room and played bananagrams and laughing. It was so fun. If you've never played bananagrams, do it. It is such a nice game and I never heard of it until our boarder came to live with us and introduced us to it. We play every evening before bed (hubby and I and whatever kids want to join) and it really calms us ready for bed. I have had some good nights rest after playing this game. It sounds like a good week! I know, sometimes life just isn't working as planned, and an easy dinner like the frozen pizza really is a sanity-saver. It isn't just that you need something quick and easy, but you also want something tasty, and completely effortless. I've had those kinds of days. The frozen pizza was probably a better deal than fast food, too. I've never played bananagrams. I'll have to look that up. It sounds like a fun evening for you all! Our granddaughter has been over since Wednesday. Surprisingly she enjoyed our salmon scraps, and basil pizza, said she loved the "dry green thing" which was fresh basil leaves. Also, she helped us roll all 16 flour tortillas, and did a fantastic job. She figured it out herself as she went along with very little instruction. I'm amazed since I cannot roll out a decent tortilla. She kept up with the pace too. She watched us collect the excess flour and freeze for the next roll out. She enjoyed the tortillas with our bean patties, and raved about the coconut flavored soy milk gelatin with whipped cream. We made pizza dough, and will ask her to make her own pizza with the toppings she prefer. My husband made pancakes using our homemade soy milk. She tried our homemade oriental dressing and liked it. She is going on 7th grade, so I thought it would be a perfect time to teach her about scratch cooking. She has always been a good saver and serious student, so I thought it is the right time to show her "that" side of frugal living. We also did a day of thrifting, and helped her buy her father's day gift. I showed her how I clean up the resin figure. Although some paint on the base cleaned off while scrubbing the tags, we worked together gluing felt to the bottom. Her parents are too busy to do these things, so now that we're retired I thought it was a perfect opportunity to show her how to do a little extra work to save money. Sometimes, unless you're shown you don't think it is possible. I explained that we figure our savings down to pennies, and that I think the dollar cumulative difference between a frugal lifestyle and a more mainstream spendthrift lifestyle is about 2K/month. She said that was a lot....and I think she will remember this well into her future. A funny note, while making the tortillas I told her the cost per tortilla is about a nickel, and rattled off the ingredients. Then later at the bakery outlet, we saw Mission flour tortillas, 10 ct package for 99c. So I asked her, should we buy it? She said no without any hesitation. She loves quesadilla so I was surprised she passed a chance to buy the tortillas ready made without having to make more. What a fun (yet highly productive) time you've had with your granddaughter! She's at a good age to be able to learn these things, and appreciate their value. She probably doesn't have a lot of her own spending money, so you're also showing her how to make some of the things she could want, or buy at a lower cost. I know that my own daughters have really benefitted from my showing them how to make what they want or check out the thrift shops first. I've always pointed out the cost to make something vs. buying ready-made. Sometimes, they do want to just spend their own money for the ease of it. But most of the time, they want to give making something a try. It'll pay big dividends for your granddaughter, in her future. And you're absolutely right, about how we go through life thinking that factories have something we simply don't have to make something on our own. That may be true in a few cases. But for the most part, the things that we buy were at one time made in someone's basement, kitchen, garage or shed, using ordinary household equipment, tools and supplies. I hope you're enjoying your weekend, YHF! When we know how to live on less, I think it allows us to be less anxious about the high cost of living. Too bad, our schools don't teach students about frugality. What a wonderful time of instruction with your granddaughter. My own adult kids really never cared much about costs of anything until they had to pay for stuff themselves. Now two are moving into apartments and will cook from scratch because they know they can't eat out nor buy convenience foods every single day! They are watching and helping me very closely as I make all their dinners from scratch. Gotta love it! I think it is a lot easier to teach our grandchildren, than our children, because we were too busy then to cook from scratch nor teach them. What spurred me was hearing that our granddaughter was not doing anything this summer, no activity of any sort, not summer school, summer fun, or extracurricular stuff. That's when a light bulb went off and we put off making as much as we could till she got here. She said she wants to help us build our pantry door system, so she'll get a dose of handyman work too. I think spending time with us, without our other grandchildren, is a blessing, because we can teach her life skills that are not taught at schools or else where. By showing her now, I'm hoping she will have an early start, or at least steer her in that direction. I even read to her Lili's post yesterday, and showed her what she can have one day if she sacrificed indulgences. Alice, my daughter, too, had to move out before learning how to do a lot for herself. Same with me too. And thanks for telling us about bananagrams....I'm definitely going to look into that, sounds like fun!! I'm trying to use up our freezer food - we cater and have a big event coming up and I need freezer space. We had spanish rice to use up some ground beef, a small pot roast (usually it's only hubby and me), fried eggs over hash browns, and BBQ chicken thighs and legs. Yesterday while shopping for an event, we grabbed a 40# case of chicken quarters for 49 cents a lb. So much for freeing up the freezer! I'll have to figure something out. I also made french bread and pancakes for breakfasts. Tell me more about your english toffee - I'd love the recipe. There is an english toffee place here that is open only November and December. It is the most delicious toffee I have had, however it sells for about $16 per pound. I'd love to find a recipe that is a good substitute. I hope those chicken quarters came packaged in 10-lb bags! That's how I bought a 40-lb case of them last summer, and I didn't know if they would be in 10-lb bags or not, until after I bought them and could snip off the band that was holding the case shut. Could you "borrow" freezer space from a neighbor or family member, temporarily? This English toffee recipe is super easy. It's just butter, white sugar, chocolate and almonds. You cook the butter and sugar to 300 degrees, and pour over half of the chocolate and almonds, then sprinkle the other half of the chocolate, then almonds on top, and cool. It takes about 20 minutes, total to make a batch. I made a half-batch this week, as I was wanting some candy. A half-batch made about 2 pounds (for about $3.50). Next time I'll make a quarter batch. I'll write up the recipe, and post it for you. Actually, Ruthie, the English toffee was about 1 1/2 lbs, not 2 pounds. So, about $2.33 per pound. Wow, such great egg prices. I found eggs at the flea market today for 75¢ for 18 eggs. I bought 5 of them and then went home and cooked up two cartons and made a dozen boiled eggs for the fridge and turned the rest into salad. I have made homemade pudding in the past, but it has been a long time. It is definitely good! I would not buy it at the store now anyway, the price of it i about $1 a box now. Ridiculously high! I'm still tickled that you can buy food at the flea market. Your egg price was also quite good, working out to 50 cents/dozen. At these prices, egg salad is more affordable than peanut butter, even after adding the mayo and other ingredients. I may even try making my own cooked-yolk mayonnaise this summer, when my last 2 quarts of mayo are gone. at Traders for 1.29. I have not seen the wonderful prices every one is talking about. The state of California has stricter laws on many things, that cause consumer prices to be higher than other places. A couple of years ago, the state enacted changes to how hens could be housed (more space per hen), which caused a bump up of your egg prices. It was a good thing, as it is a step in the right direction for protecting the US poultry supply from disease, but painful to have consumer prices higher. If you did find something like a case of eggs, at a great price from Smart & Final/Cash & Carry, do you have someone you could split a case with? Someone who comments, here, lives in the LA area, and her husband brings home cases of what's called loose-packed eggs (like what I buy) from Smart & Final, I believe. Just a thought. 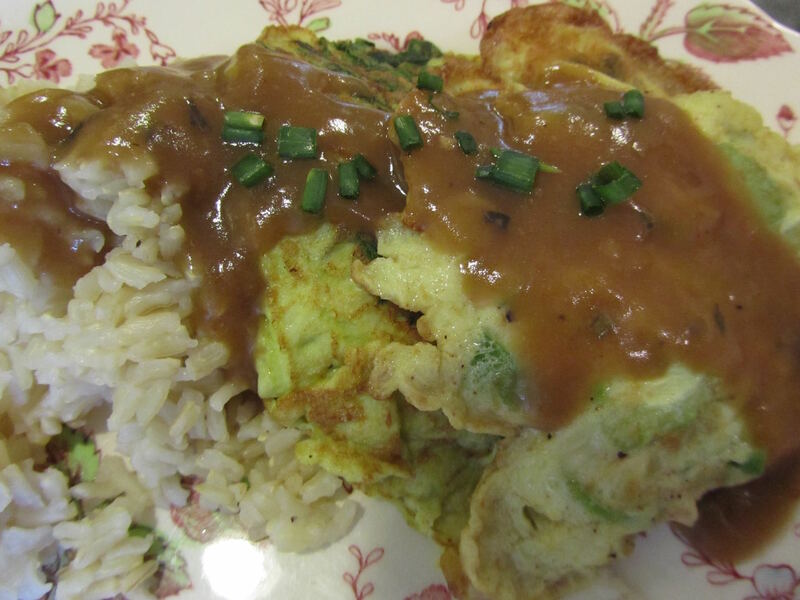 I love Egg Foo Yung for it's simplicity, yet it tastes so good. I had leftover pork roast gravy, so I added that to the brown sauce (which was just flour, soy salt, ground ginger, red pepper and water). It was really good, and used a lot of bits of veggies. Enjoy the rest of the weekend, Patti!